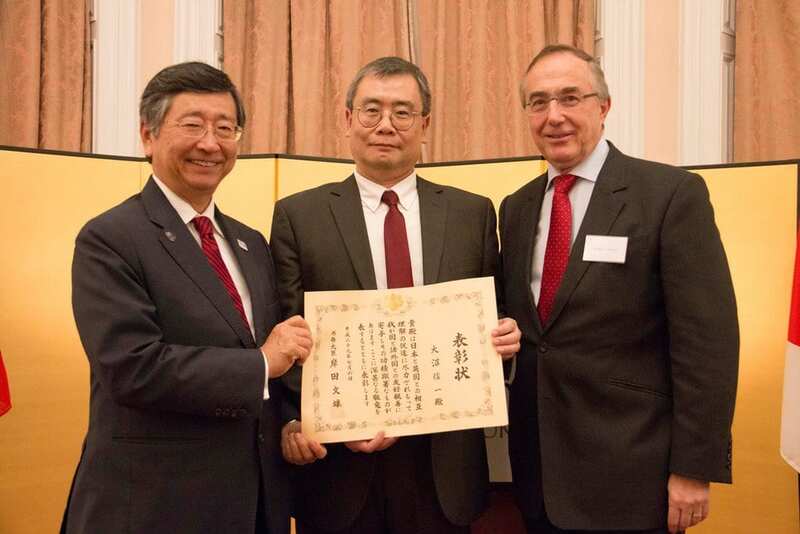 UCL’s Japan ambassador Professor Shin-Ichi Ohnuma has been awarded the Foreign Minister’s Commendation for his contribution to Japan-UK academic and educational relations. Earlier this month, Ambassador Koji Tsuruoka presented Ohnuma, Professor at the Institute of Ophthalmology, with the award at a ceremony at the Embassy of Japan in London. In addition to his work as Director of the PhD programme of the Sensory System, Technology and Therapies, Professor Ohnuma has worked over many years to strengthen UCL’s ties with Japan. Professor Ohnuma’s collaborative work includes the organisation of numerous important events. In 2013, he helped to organise celebrations involving various Japanese organisations to mark the 150th anniversary of UK-Japan academic collaboration, when five Japanese samurai – known as the ‘Choshu Five’ – first came to study at UCL. Speaking after receiving his award, Professor Ohnuma said, “UCL has an amazing history with Japan, which includes the Choshu-Five and Satsuma-19. In 2014, Ohnuma played an important part in the ‘Japan-UK Universities Conference for Collaboration in Research and Education,’ co-hosted by UCL and the Embassy of Japan in the UK. Attended by 14 Japanese universities, 16 UK universities and the Prime Minister of Japan, Shinzo Abe, the conference encouraged further collaboration for not only UCL but many universities in both the UK and Japan. A champion of future talent, Professor Ohnuma has also worked to encourage mutual understanding between young people in Japan and the UK. In 2015, he established the UCL-Japan Youth Challenge programme to promote interaction between students in both countries. Hosted by many organisations in the UK, it has since been held annually, with around 100 students from both countries involved. Professor Ohnuma has also made significant contributions to his home prefecture, Fukushima, which was badly affected by the 2011 nuclear disaster. On top of supporting reconstruction efforts in the area, he played a key role in arranging a Memorandum of Understanding between UCL and the Fukushima prefectural government, and supported UCL students’ recent visit to the region.